You may have mastered the first anniversary, but don't let the second go by without the same level of attention. Your love hasn't faded so why should your appreciation? The good news is that, with these stylish 2nd wedding anniversary gifts, you can maximize impact while minimizing effort. Gift one of these timeless designs and watch the love of your life's face light up, time and time again. Honor your shared love of the great outdoors with a wall display of all those magical moments together. Have you and your spouse been living a life of adventure? 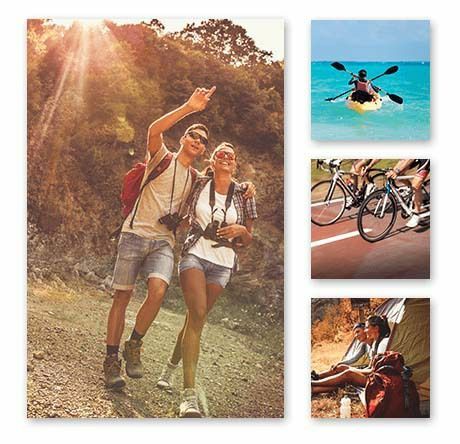 Whether it's overseas travel, beach camping or simply bike rides around your local park, capture the charm on camera and print it as a stunning wall display. 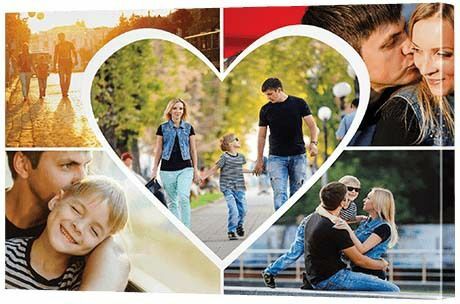 This canvas wall display, with one large panel and three small, is a wonderful way to present a photo story of your two happy years together. Check out your own Facebook pages - and even your friends' - to find a candid series of pictures that represents the energy, excitement and emotion behind your love. Don't have anything handy? Hire a photographer to capture all that wholesome outdoor goodness then print it for an amazing, professional result. Give an old wedding photo a new lease of life, transforming it into a new work of art. Has your wedding album been abandoned to a bottom drawer? It's not a matter of never wanting to see it again, it's more about tidying up the clutter - and that's OK. But if your walls are begging for decoration, decide now to choose a photo from your wedding collection, scan it and print it. 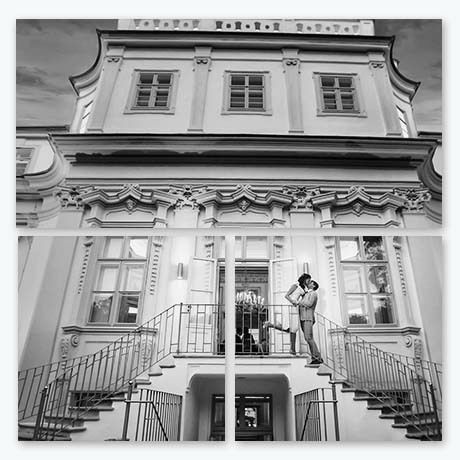 A split image canvas is an elegant way to present a single photo. Taking away the color - converting it to monochrome - gives it an extra edge. Wall art is the result. First there was two and soon there will be three! Welcome the change to come with a precious pregnancy print. Remember the elation before the birth of your new child with a touching, cheerful preganancy collage - worshipping the mother to be in all her glory. Printing on glass gives the collage a fresh, bright feel. With this creative framing and room for nine photos, there's plenty of room to feature numerous photos of the goddess that is woman as well as proud as punch photos of the future Dad. 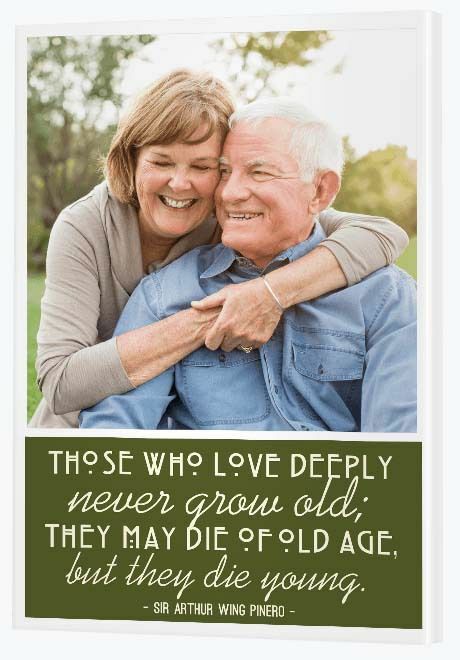 Finding true love at an older age is something very special that simply must be recognized. Did you meet someone extraordinary in your twilight years? Or know someone who did? Find a photo that captures their loving relationship and a quote that signifies their spirit then print them together onto canvas. This traditional collage, featuring just two panels, is a wonderfully simple yet striking way to present a declaration of love. To create an image with a quote, visit Canva where you can design a graphic featuring whatever font style, font color and background color you like. Download the image onto your computer then select 'Create A Canvas' to start using our easy collage creation tool. Love her more than anything else in this world? This is a gift that will show her all that and more. This gorgeous wall display looks harder to create than it is. It's actually very simple. The trick is using graphic design tool Canva to create each of the images then printing the images as a glass display through us at the Canvas Factory. Choose four quotes or short poems that will make her melt. To easily find some of the most romantic quotes on the Internet, visit Google or Pinterest and look up 'love quotes'. Alternatively, make up some of your own! If she loves bold colors, choose bold, bright backgrounds. If she loves pastels, choose softer backgrounds like this yellow, purple, pink and blue combination. With a gift like this, she'll fall head over heels in love with you all over again. 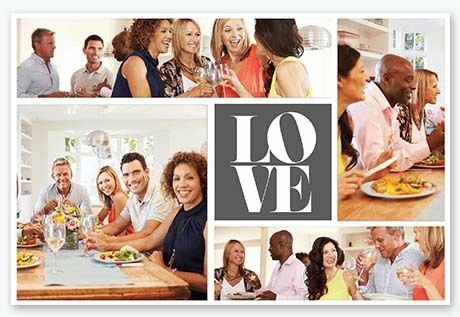 Put your love front and center with a love themed collage, celebrating partnership, family and friends. We often think of love as something special shared between two people - and sure it is. But support for that partnership also comes from further afield than that - it comes from friends and family. This is a a wonderful second wedding anniversary gift for that special pair who value family. It's not just the two of you against the world. We're all in this together. If you've married someone who already has kids, acknowledge that new family unit with a gift from the heart. Often it's hard to find second wedding anniversary gift ideas that will make your partner's heart skip a beat, but this gift will seal the deal. It can be tricky to navigate a new relationship when it involves children from a previous relationship, but it's often very important to involve kids in the journey of love. This modish heart collage has a special spot in the middle to include a photo of the two of you and the kids with plenty of room on the outside for other family photos. Build a visually beautiful bucket list of the places you want to travel to together. Need some inspiration to save for that big trip? Then print your dream locations on a travel collage and start working towards it. Stop simply talking about visiting Cairo, Tokyo, Africa, Cozumel and Taiwan. It's time to take the plunge and make it happen. What rocks your boat? A safari through Africa? The big city lights of Tokyo? The northern lights of Finland? Find beautiful royalty free photos from places like Google Images, Flickr and Unplash or search in our Canvas Art library. 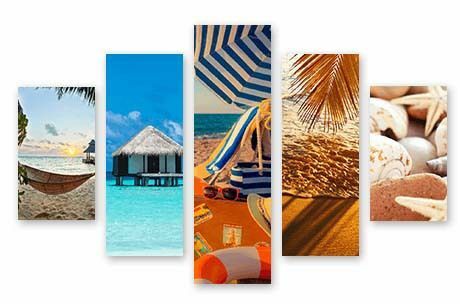 You can build this travel themed collage yourself via 'Create A Canvas' or email through Canvas Art library links to us at [email protected] and we'll build it for you. 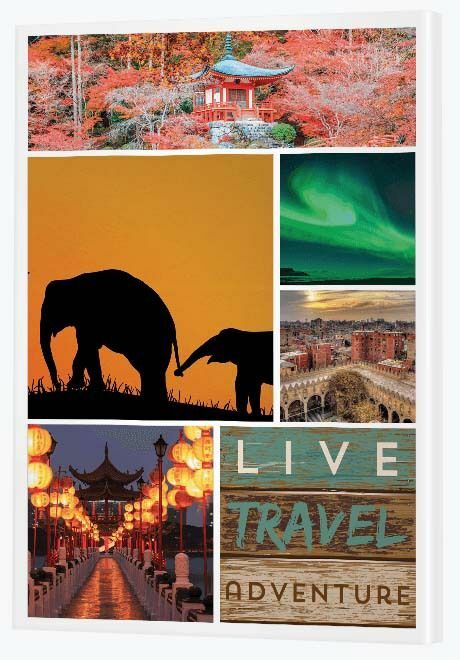 If you're not a fan of the quote on the travel themed collage and want some flexibility to add your own quote, be sure to take a look at the traditional, modish and silhouette collage designs. All the frames in the non-themed collages are blank which means you can add any image you want, including a quote that will inspire you to make those bucket list dreams come true. Now, which place will you travel to first? Enjoying your new home life together? Surprise your husband with a work of art. Whether you're already well and truly settled in your life together or you've just moved into a new home, this is a gift that will lift his spirits. Abstract art is a crowd pleaser and the good news is you can choose a masculine print for him that you also love. 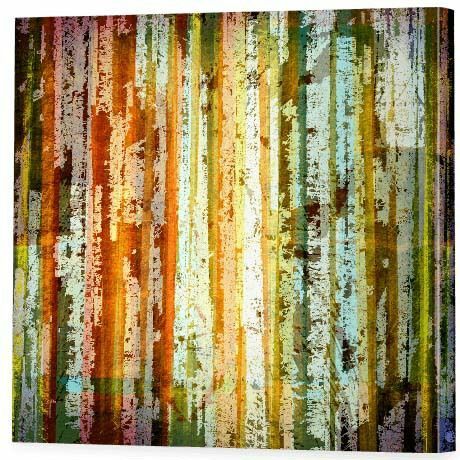 Colors of the forest abound in this edgy piece, wonderful for a living area or office space. Search for an image that will complement your home in our Canvas Art library where you'll find over 20 million high quality images. Hot tip: To find abstract art, rather than browsing through the categories, simply search for 'abstract art' in the search bar. Embrace family with a 2nd anniversary wedding gift that will be treasured for years to come. This gorgeous baby carriage silhouette collage has a generous 10 frames to fill with baby photos galore. It's the end of your second year of marriage and together you've created this beautiful baby. Cherish every moment of those early days and find photos that will continue to live on as your baby grows. This collage creation uses a cute pale blue border to bring out the fun of the carriage. Sure, you can print this collage on canvas, but printing on glass provides that fresh feel, perfect for baby photos. Stuck for photo ideas? Include full body photos of baby and baby with family, but don't be shy about zooming right in to feature the cutest of cute baby body: fingers, toes, lips. The other trick is to take all the color out of the photos, making them monochrome (otherwise known as black and white). This, paired with the dusty blue, is ever so arty. You can change the color of the border and the photos using our easy, but amazing CanvasApp. To get started on designing your unique print, visit our front page and select 'Create A Canvas' or click on the 'Build A Baby Collage' button below. Love the beach? It is time to live your dream? This seaside wall display will excite and inspire. You've decided you don't want children, but you do want a holiday house by the beach. Images can have a powerful influence, so choose a wall display that depicts your dreams. Imagine everything that is beautiful and wondrous about beach life, print it to canvas, place it in your living area then live and work towards building that dream each and every day.